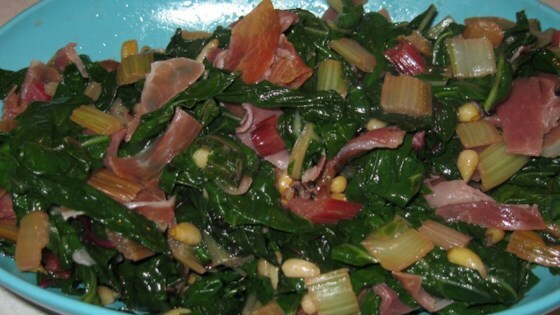 "Wilted Swiss chard packed with Italian flavor!" Heat olive oil in a large skillet over medium heat. Cook and stir the pine nuts in the hot oil until they turn a light golden brown, about 2 minutes; watch carefully, they burn easily. Stir in the garlic; cook until fragrant, about 1 more minute, stirring constantly. Mix in the Swiss chard; cook and stir until the chard has wilted, 3 to 5 minutes. Season with salt and black pepper. Lightly stir in the chopped prosciutto; cook and stir just until prosciutto is hot, then serve. This was a hit with the whole family. It converted my husband to Swiss chard and even pleased my 2 year old. Way too salty! This would be pretty good without the prosciutto. I used dinosaur kale instead of swiss chard.